A few people have mentioned to me that they'd love to hear the Cajun accent I had before we moved away from Louisiana in 1987. 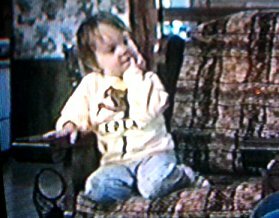 So here are some pictures and sound clips of 5-year-old DeeDee, reciting the story of Snow White as it was told on her favorite story record. 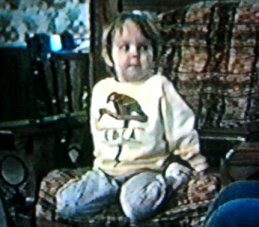 It's 1984, I'm at my uncle and aunt's house, and I didn't know I was being videotaped. 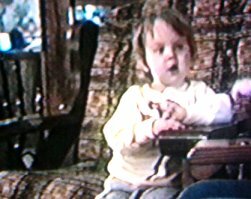 Clip 1: The happy mother decided to call her baby Snow White. But the queen was very ill, and one day when Snow White was still a little girl, her mother died. Snow White's mother's king was broken hearted, and for many years he was sad and lonely. But the lonely king married again, and there was great rejoicing in the... and there was great rejoicing in the land. Clip 2: Every day she asked, "Mirror mirror on the wall, who is the fairest of us all?" And they said, "Her lips like bloody, her hair like night, her name Snow White!" And the queen called her huntsman to her. "Take the princess into the forest and bring back her heart in this jewelled box and kill her!" Clip 4: They went upstairs and they opened up the door and they saw Snow White sleeping in the bed and they said, "It's a monster! It's a ghost! It's a dragon! It's a skeleton!" And you know what? They took... they raised up the blankets and they saw Snow White! It wasn't a monster or a ghost or a dragon or a skeleton! No! It was Snow White! Clip 5: She fell dead. (She died?) Nooo! She wasn't... She wasn't really dead! She didn't die! "Ruuuun into the forest and hide!" Note my beloved "Edea" shirt from Audubon Park in New Orleans. "You're not little children, you're little men!" "And you know what happened next?"